Presumably Android is caching something (perhaps the directory list?). Might be worth trying just a few songs placed in a root-level folder on the SD Card and see if that works more reliably? Also worth seeing if tweaking the audio output mode and/or buffers make a difference. I tried to test this by placing two gapless songs in a root folder on the SD, but after I increased the SD buffer on Android. For some reason now any gapless album plays perfectly gapless even after doing a full rescan of my entire ibrary and not just loading the root folder. The problem is that now I'm not able to reproduce the gap I had before. I tried to bring back the SD buffer but this won't change anything. So, happy that Poweramp is now playing gapless on my phone, but frustrated I can't check what solved the problem. It looks like increasing the SD buffer on Android did the trick, but I'm not sure. If at anytime the gap returns I will try to reproduce what fixed the problem and inform you guys. @maxmp this and the previous post by Andre might be interesting for you. Glad you guys are figuring it out. So, does it actually play gapless from SD on second play? If so, is the player keeping the track in memory or something? I wonder if he could add some kind of buffer for smooth playback from SD? @andrewilley @maxmp ok, so the gap returned. The behaviour is strange, but this is what happens. Poweramp plays anything gapless during the first run of songs in a certain period after folders are added. Following Andre's suggestion I removed all my folders from the library than added just the root folder with just two gapless files. It ran gapless smoothly. Then I added all my regular folders to the library and Poweramp did it's scan. A certain period after Poweramp finished the scan anything played gapless the first run. However over time the gap returned without me changing anything. I will investigate whether the same happens when I only add folders from the internal memory and keep you guys posted. Thank you for giving this your attention, Max! My understanding is that WMA files are gapless and played as such on v2. I'm really not wanting/able to re-encode all of my music to another format. Would the future fix of "pre-fetchinig earlier" have a positive effect with WMAs? Always process album art doesn't work in recent versions (795, 796), on older betas it was fine. I want to use that with the unofficial Android Auto plugin (PowerampCar) which was posted here. This is the only thing that doesn't work, so I can live with it, just a report. It's not working on Nougat and Oreo too. On Oreo there are some other issues as well, still has some background service start exceptions in the logcat, and the bluetooth controls doesn't work in my car at all (so does the text and album art display), but the music plays if I start it on the phone. This issue only affects Oreo (or probably Pie, didn't have that on my old OnePlus X currently), on Nougat its working fine. I like the new version, and UI, thanks. Hope it will get official Android Auto support in the near or far future, it's a must have for me. - the size of the library does not affects this behaviour. It happens when only one folder with two files are added to the library as well as when the entire collection is added to the library containing thousands of folders and files. I hope there is a way to solve this and I hope there soon will be phones with at least 512 GB of internal storage ? If I can be of any further help, please let me know. Good luck with further development and thank you for all these years of joy Poweramp provided! Long story short: The skin developer created a separate thread with the v1.1 update, so I requested my old thread to be deleted to avoid confusion. 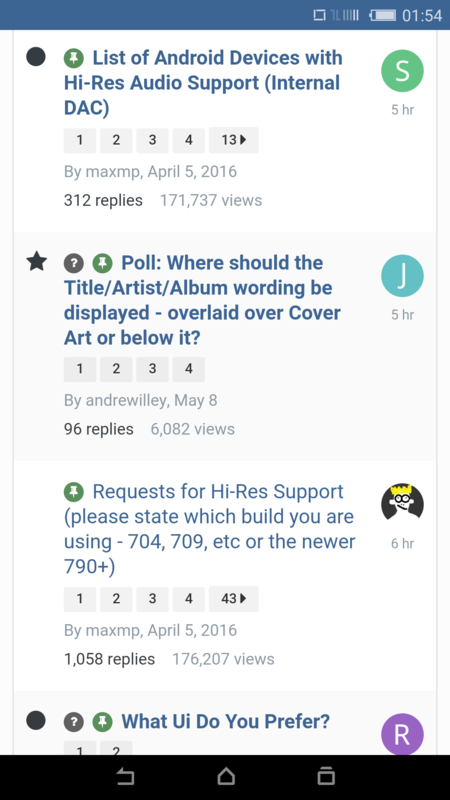 @andrewilleyHi, the topic for version 797 has been deleted? Only in the download section can I see and download this version, does that have any reason? It got renamed and unpinned somehow, now fixed.